LAND holdings in the hills of Uttar Pradesh are small and scattered, sometimes several kilometres apart. As a result, rehabilitation of degraded or wasteland in these areas has become a problem. Farmers waste a lot of time going from one field to another, which makes cultivation unprofitable. The result: vast amounts of land have been abandoned. Village Arah, five kilometres from the nearest road (Garur town) in the Kature valley, under the Gomti basin is no different. The village is located at an altitude of 1,468 metres above mean sea level (in masl), and covers an area of about 99 hectares (ha), about 30 per cent of which is cultivable wasteland. Out of this, 9 ha is divided among 86 families and consists of abandoned land. To increase agro-productivity on this land, the Govind Ballabli Pant Institute of Himalayan Environment and Development (GBPIHED), Almora, made an attempt to consolidate the scattered land holdings. After repeated interactions with the villagers and the van panchayat, it succeeded in getting the villagers to sign a memorandum of understanding with the institute wherein the farmers handed over the land to the institute for a period of five years. No changes were made in the land records of the state department. The rehabilitation of the land called for an integrated approach. One of the main prequisites was to alleviate water stress. Two low-cost underground tanks, lined with polythene to prevent seepage, were constructed. Even a small trickle was diverted through low-cost rubber pipes, laid one foot below soil surface, to take care of interference due to animals and forest fires. To prevent grazing, the entire area was fenced with a stone wall, while protection against human interference was guaranteed by the villagers themselves. Soil erosion was prevented by making check dams and run-off from higher regions was diverted towards permanent rivulets. This ensured that water was drained and utilised in a way that not a drop goes waste. 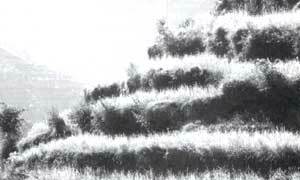 Plantation was decided on the basis of the villager's requirements so that there was less pressure on the forests, and simultaneously, trees were also planted along terrace rises to prevent erosion. To minimise damage due to long-distance transportation of saplings, a nursery of all the major species was raised on the site with the participation of the people. Trees like utish (Alnus nepalensis) and bhimtal (Grewia optiva) were planted to meet fuel and fodder requirements. These trees provide fodder in winter, when it is scarce. The bark of the tree after treatment yields fibre which can be twisted into ropes and used by villagers to muzzle the draught animals working in fields. They also sell the ropes to the nearby villages to earn an extra income. The residue, after fibre extraction has good burning capacity and can be used as a torch. The fodder of bhimtal is used in barter systems wherein the trees are loaned to needy livestock holders who do not have fodder. The tree holder is given ghee in exchange. It is now four years since the project was initiated. Dan Singh Parihar, the village pradhan, proudly says: "Barren land has been put to good use and I am sure the benefits will continue." According to B P Kothyari of the GBPIHED, "Soil carbon, nitrogen, phosphorous organic content and micro-organism levels have increased. Analysis on the type of vegetation coming up in the area indicates that the ecosystem is heading towards stabilisation. And the villagers are planning to form a cooperative so that the management of the site could be improved." The success of this effort will certainly encourage other villages to make such an effort, says L M Palni, director of the institute. The villagers have gained confidence and rather than looking towards the government to meet their demands, they are now striving for independence, he adds.